The one who watched me grow and the one who helped me grow. I’m not sure how the three of us ended up being friends, but the earliest memories I have is Winnerz. I remember Shradha raving about Liya and how much fun they’re having and me, being in a separate batch, obviously grew jealous (Classic Anagha). So I instantly changed my batch to theirs. Damn, what a great decision. From eating in between classes and giving bad relationship advices – we became the best of friends. It’s impossible to imagine my 11th and 12th grade without my friendship with these two. Some of my happiest memories in Bahrain were with them. I’ve watched them both grow from insecure to beautiful inside and out and confident af and immature to one of the most mature and wise young person I know. Who tolerate and love me even though I’m super needy almost always. There’s not a day where I don’t miss you guys and our shenanigans. Words will never be enough, but I’ll start somewhere by saying Thank you and I love you. This thirst didn’t go away so easily. Some partner, I didn’t even ask for. You laugh, but it’s a serious one. The seven wonders of the world? This was my life, in a nutshell. but I would still wonder about the place I’m not at. What am I missing out? I was back home, as usual. I didn’t think of being anywhere else. The charm in your smile. Any place other than your arms seemed unnecessary to be in. This past week, I went to Chennai to visit my cousin. It was the first time I visited Chennai after almost 2 years. It was wonderful thinking about how much I’ve changed, evolved as a person, since the last time the city saw me. The first time I was here, I came with my mom, she took care of everything and then she left. All I had to do was go for classes till noon and come back and study. And that’s all I did. I was all alone in a city I didn’t know and all I heard everyday in the phone calls from my parents and relatives was to be careful. So that’s what I did. I was careful. I shut myself up in that apartment and only went out for the daily dosage of CLAT prep. To me, Chennai was an intimidating city. Everything was new and scary. For instance, I walked to classes. And I remember how terrified I was of crossing roads. I even took the long way round if it meant that I could avoid crossing busy roads. And when my classes ended after 25 days, I didn’t want to travel in a train all by myself, so my uncle came all the way from Kerala to drop me back to Kerala. It all seems so silly now. Now I travel every chance I get. And If I’m alone, its better. The roads aren’t intimidating anymore, it’s just annoying(how drivers refuse to stop!). I take care of all my needs myself. I feel independent and free. Chennai always holds a special place in my heart, for, it’s where the second phase of my life started. Thinking about all these instances gives my a small sort of pride; this is character development right? I was young when they announced Taj Mahal situated in Agra, India as one of the Seven Wonders of the New World. I remember thinking then that, this monument, made entirely of white marble, and semi precious stone and spent over 32 million at that time, must be a magnificent sight. I mean, why else would a TOMB and a building around it be named as one of the Wonders of the world, right? 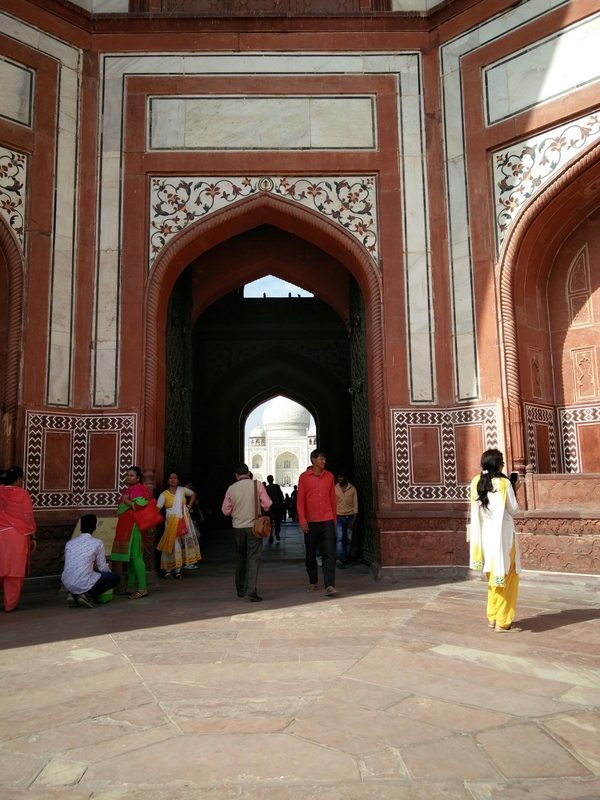 This year, during March, I had the opportunity to visit, New Delhi. And I didn’t waste that, and immediately booked a tour ticket to Taj Mahal. My excitement was beyond words. I was so close,to witnessing a beauty of a building! Finally, the day arrived. The people who organised the tour were smart. They took us to Agra Fort where we got the first view of the white marbled domes and the River Yamuna. The King Shah Jahan under who’s reign, the Taj Mahal was built wanted to see the beautiful building he built for her- Mumtaz Mahal, who was supposed to be his favorite wife, all the way from his palace, the Agra Fort. All this history lessons lead up to the grand finale, the big one- Taj Mahal, aka, Crown Palace. We entered through the west gate. We had to travel almost half a kilometer from where the bus was to the ticket counter. A Rs 40 ticket was all that stood between me and one of my childhood dreams. We started walking from the ticket counter to the gate. And there it was. Through the doorway for the west gate, we could see the main dome of Taj Mahal. I had shivers all over my body. It was not how they described at all. It was much more that anyone could ever put into words. We walked forward, closer. Even though the white marble, was significantly yellow-ish, it still stood majestically. For a moment I didn’t know what to do, or say. All I could do was look at this marvel barely 500m away from me. It was crowded, filled with tourists and photographers asking us if we needed pictures, but my eyes didn’t move. They were set on, the beauty, Taj Mahal. As we got closer, the beauty just increased. After the traditional picture-taking session, we entered the building. There they were- King Shah Jahan and his favorite wife, Mumtaz Mahal. * The cold air inside was soothing after walking under the scorching heat. We came outside again to a beautiful view of the river Yamuna. Even though, there was barely any water in it now, it must’ve looked beautiful long ago, when the Taj was built. We sat on the cold marble for a while and I couldn’t help but be spellbound by the sheer brilliance of artistic talent, just to make one building for the tomb of one person. In love with the emotions surround the building. And that’s one down. Six more to go. I starved her to death? Queen that rules my life-Time? Oh, is that a new book by (x author)? Oooh, can i borrow it? They’re just waiting for the right book. Back to where it started.